Ali & Matt at Onteora Mountain House in Woodstock N.Y.
We recently had the pleasure of working with Ali and Matt on their mountaintop wedding at Onteora House in Woodstock, N.Y. This Catskills venue is just amazing. The ceremony and reception areas were set among giant mountaintop trees and overlooked deep valley views, which just started showing a touch of early autumn hues. The day started off a bit overcast and chilly but, as if on schedule, the skies cleared up and only a whisper of spirited wind remained for the wedding ceremony. After close to a year of working with the bride, it was truly exciting to see how wonderfully everything came together. We had designed a soft color palette with dark punches of burgundy and sangria. 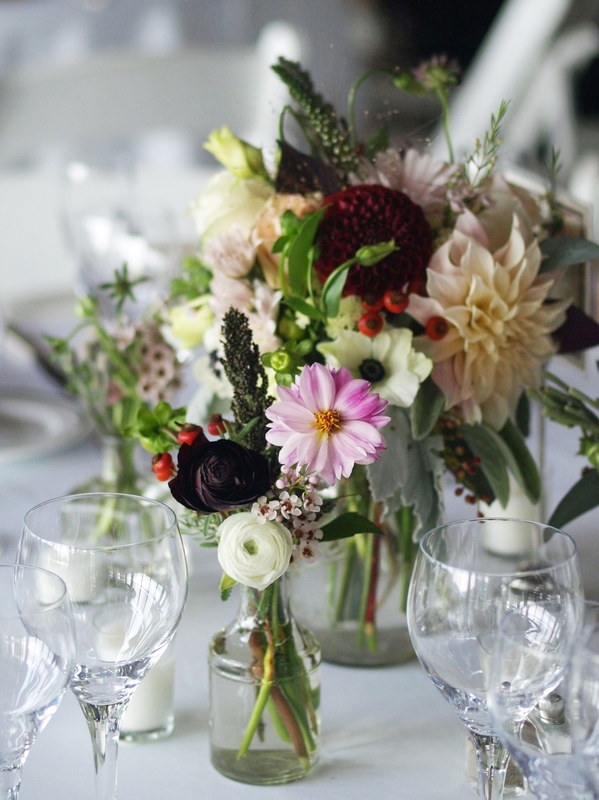 The centerpieces consisted of authentic vintage Ball and Mason jars I had picked up at various flea markets and auctions, as well as Ali’s collection of bud vases which nicely complemented the jars. 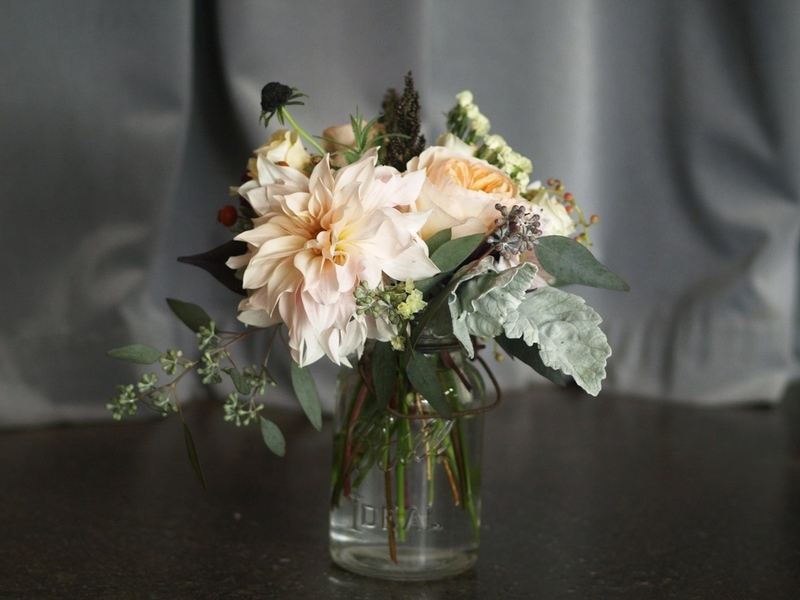 The bouquets and centerpieces featured a mix of dahlias, anemones, roses, ranunculus, scabiosa blooms and seed pods, thistle, berries, lambs ears, eucalyptus, and rosehips. Each table radiated elements of elegance and wildflower freedom. On a side note, Onteora House is a great venue with great spirit. While setting up for a wedding, a florist gets to sneak around a venue, overhear lots of chatter and see how things work. I can honestly say that the people working at this venue seem to be one happy bunch. It was a joy to be in the midst of competent employees who got along with one another and appeared to be having great time working to ensure that the couple’s needs were met. It was an amazing wedding and I took great pleasure watching the guests gasp at the breathtaking mountaintop views. So fun!